This topic has 31 replies, 18 voices, and was last updated 6 months ago by chestercopperpot. As a 41 year old male who has never bought or owned aftershave, am I in the minority? Yep probably. I’ve not bought any either as far a I can recall. Usually get some at Christmas or Birthday. Pretty much had a beard for 99% of my adult life so tend to use scented balm or beard conditioner instead. If I had to buy any I wouldn’t be spending £37 never mind £97 for what’s basically water and some mixed scents. i don’t think people buy expensive aftershave any more, maybe you are confusing it with EDT or EDP? but i don’t own a large depreciating asset to sit motionless in a jam (a car) or have a stupid high mortgage so £50 a year on cologne isn’t something to agonise over. Bought it? Probably not in the minority. Owned/Used it? Then probably in the minority. Never bought it for years but like others I own some through gifts. Seems you are in a minority and others don’t understand the concept of owning. Ever, ever? Only bought/used it when I was a teenager. FYI it’s nothing to do with shaving either, it’s perfume. I have in the past bought post shave moisturiser, but that’s as far as I’ve gone. The nearest I’ve come to having any in my possession is those small samples you used to get in magazines. This is interesting. I’d like to know the relevance, because I am, but haven’t always been… but I’ve never used aftershave.. is this why all my relationships came to an end?? There are scents now that my brain still associates with ladies from my past. I walk past someone in the street wearing it and boom, I’m back in the room. My wife recently bought a bottle of something by Joe Malone that instantly had me thinking of my (deceased) father. Maybe not the reaction she was hoping for! I can’t recall a time as an adult when I’ve not had a bottle or two of something smelly (aftershave? Not sure, bloke’s perfume basically whatever it’s actually called). They last for years I use them that sparingly and infrequently. But I’m glad they are there for when in the mood. I think they are meant to go off after about a year so probably don’t smell as they should. Don’t ever recall actually buying them though – they seem to materialise. Oh yeah, I get that too. Quite disturbing the memories some of them invoke.. not sure whether I like it or not. Never bought the stuff but have received as gifts in the past which have been given away to others. Don’t like the stuuf, never worn it. Not as bad as womens perfume, most of that stinks of cat piss. Cat’s piss? You must be extraordinarily sensitive to the smell of synthetic civet (no animal extracts are used nowadays) which is present at aout 0.01% in some perfumes to give warmth to the background. And civet comes from civet cats not domestic cats and is not urine, it’s a territory-marking scent. If you only buy a bottle of perfume every few years, keep it in the fridge to reduce oxidation, especially as the level drops and more oxygen gets into the headspace. Aftershaves no – EDTs yes; oud wood on the shelf at moment. Doesnt everyone spray a bit of lynx on after a shower/bath? Same here. Well I have had some as gifts, but I just give it away later. I trust I don’t smell truly awful, but really have no idea. I have been flagged down in the street before by a female stranger & asked what aftershave I’m wearing because I smell so good. By the way… what’s EDP or EDT? 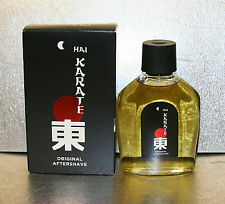 I bought 6 bottles of Hai Karate for £2 each at Poundworld before they gone bankrupt. see that long narrow window in your browser near the top? type that in there and hit return. I was was about to ask this too. Sound like diseases or shady clandestine government agencies. Neither of which I’ve owned or purchased. I use Happy by Clinique which is quite fresh and citrusy. This is probably very soppy but I’m away with the RN a lot and receiving a pillow slip, mid-deployment, from my Wife with some of her perfume on made my day so I return the favour when I’m not around. I feel like I have travelled back to the late 70s early 80s with Hai Karate. Generally speaking EDP is meant to be better lasting than EDT, hence commanding the extra cost. There is usually a change in smell though, though not generally discernible after it’s settled on your skin. When I added the aftershave, it kept them abbreviated. Hence the question. I like smelling nice of perfume. Yes indeed the STW gold standard.